PRODUCER STAN DA MAN FIRST ACHIEVED SUCCESS IN 2000 WITH LANDING 6 PLACEMENTS ON SAUCE MONEY'S "MIDDLE FINGER YOU" ALBUM. IN 2013 STAN DA MAN PRODUCED A TRACK FOR BK CAVALI (RUSSEL SIMMONS GODSON), HIS SINGLE "THAT BOY FROM NEW YORK" WAS ON THE BILLBOARD BIZ CHARTS FOR 20 WEEKS. SINCE 2014 STAN DA MAN HAS COMPILED MAJOR PLACEMENTS INCLUDING PRODUCING TRACKS FOR DJ KAY SLAY MIXTAPES AND PRODUCING FOR HIP-HOP ARTISTS LIKE NOREAGA, SHEEK LOUCH, STYLES P, JOELL ORTIZ, TRICK TRICK, PAPOOSE, FRED DAGOD SON, TONE TRUMP, INNOCENT?, HADDY RACKS, UNCLE MURDA, YOUNG CHRIS AND THE HOODIES TO NAME A FEW. STAN DA MAN HAS ALSO DONE MUSIC FOR KAY SLAY’S STRAIGHT STUNTIN SHORT FILMS AND BEEN FEATURED ON SWAY'S FRIDAY FIRE CYPHER FOR HIS PRODUCTION. STAN DA MAN HAS PRODUCED HEAT FOR JACK THRILLER, NUMEROUS CYPHERS AND RELEASED HIS OWN INSTRUMENTAL MIXTAPES. WE RECENTLY CAUGHT UP WITH THE PRODUCER TO DISCUSS HIS HIP-HOP JOURNEY THUS FAR. STAN DA MAN: Growing up I listened to real soul music and hip hop in my household. I was raised hearing the motown era all the time. Hip-hop like Run DMC, LL Cool J, Sugar Hill Gang, Kurtis Blow, Grand Master Flash and The Furious Five, NWA, The Juice Crew, Rakim, Krs One and the list goes on and on. STAN DA MAN: A great producer is a producer that makes sure that their music is a great fit for the artist... arrange music for the artist and believe in theirself to make great music for the world. STAN DA MAN: When I brought my sp-1200 and s-950. STAN DA MAN: I use my iPhone and my iPad with this app called “Intua Beatmaker 2”. It's the best app you can ever use on your iPhone. It has everything you can make some real fire with this app. STAN DA MAN: I was a DJ then I became a producer shopping my beats. STAN DA MAN: Being home with family to work on my craft. STAN DA MAN: My goal is to make that fire everytime and to make those hits and get those plaques. STAN DA MAN: One of my mentors is DJ Premier. I met him at a DITC Beats Per Minute Showcase. I haven't worked with him yet but I hope to in the future. Premier influenced me in a big way with his production... it's fire and over the years he never switched. VALIDATED: Who would you say inspires you? STAN DA MAN: Pete Rock, Just Blaze, DJ Premier, Marley Marl, Easy Moe Bee, Havoc, Dr. Dre, D.I.T.C Crew, P. Diddy's Hitmen, Large Pro, Kenny Buttons, Marv, Suits, the whole iStandard Team, Motif, Alcatraz Ed, the ECC Team, Buda and Grandz, Flip Jackson, Loose Connxshun, DJ Static and Jaymz the DJ to name a few. VALIDATED: Who are your top 3 producers of all time? STAN DA MAN: Quincy Jones, Dr. Dre and DJ Premier. STAN DA MAN: Sauce Money, DJ Kay Slay, Sheek Louch, Styles P, Papoose, Tone Trump, Sway's Friday Fire Cypher and many more. VALIDATED: What advice would you give to upcoming producers? STAN DA MAN: Pray, grind, never give up on your dreams and the biggest thing is keep making that fire. VALIDATED: What upcoming projects can we expect in 2017? STAN DA MAN: I got this Innocent? and Nutso project, I got my bro King Bo. I just did a track for Ms. Hustle. I got some major artist that are in the works right now stay tuned. VALIDATED: What made you make the switch from dj to producer? STAN DA MAN: I have an ear for music. Watching people like Pete Rock, Marley Marl, DJ Premier and other producers I was around with the music they were influencing me to go into producing. They would always say I have a great ear for that hip-hop sound. VALIDATED: As a producer, what advantages if any do you feel you gained by starting off as a dj? 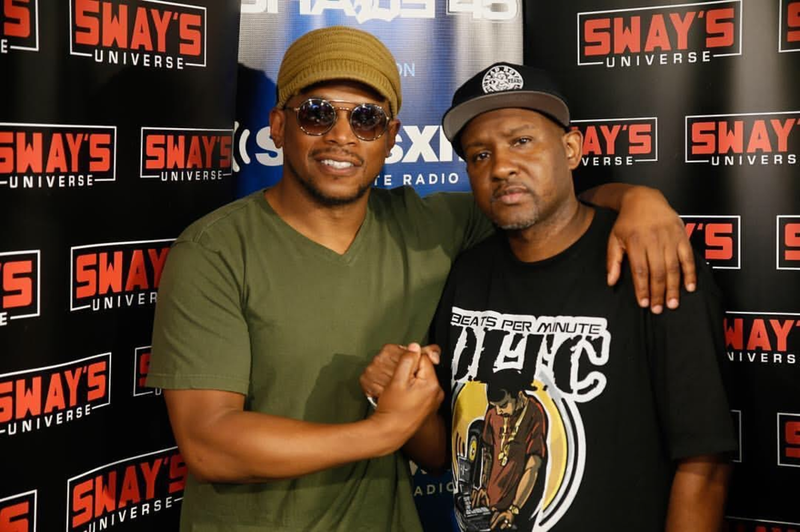 STAN DA MAN: I learned a lot from dj'ing like hearing those break beats on key and putting them back from the beginning of the break part again. Like how I hear the samples on key and looping it from the back from the beginning of the sample. VALIDATED: How did you get your start dj'ing? STAN DA MAN: I got my start dj’ing seeing my uncle dj’ing in the parks in brooklyn. He taught me at the age of 9 how to dj, how to spin those breakbeats in the park and make people lose their minds seeing me so little dj’ing. VALIDATED: WHATS YOUR REACTION TO DJ RED ALERT AND FUNK MASTER FLEX'S SUPPORT OF THE INNOCENT? TRACK, "87" PRODUCED BY YOU? STAND DA MAN: HEARING DJ RED ALERT AND FUNK MASTER FLEX PLAY INNOCENT? 'S "87" IS A BIG BLESSING FOR ME. AFTER HEARING THESE ICONS FOR YEARS PLAYING A LOT OF HEAT AND TO HEAR THEM PLAY SOMETHING THAT I PRODUCED, ONE WORD, AMAZING! SALUTE TO DJ RED ALERT, FUNK MASTER FLEX AND EVERY OTHER DJ SUPPORTING "87". I TRULY APPRECIATE IT. VALIDATED: WHAT UPCOMING PROJECTS DO YOU HAVE FOR THE REMAINDER OF 2018? STAND DA MAN: I GOT SOME GREAT THINGS HAPPENING. I PRODUCED A NEW TRACK FOR PAPOOSES UPCOMING PROJECT, I DID A THEME SONG WITH MY BOY RILLA GUAGE CALLED "BRICK CITY" FOR THE "JERSEY" WEB SERIES, ME AND INNOCENT? COMING OUT THIS YEAR WITH "WHIP APPEAL 2" AND "BQE" WITH OUR BOY NUTSO. THE BIGGEST PROJECT I'M SO PROUD OF IS A MIXTAPE CALLED "THE CO-SIGN PROJECT" HOSTED AND PRODUCED BY ME.